3 Phase Paleo by The Paleo Parents-eBook Review! 3 Phase Paleo eBook Review, by The Paleo Parents! Three things. Three, that’s all. 1) Swap, 2) remove and 3) Heal. Okay, maybe 4? The 4th being your motivation, but with a user-friendly, simple and helpful eBook to get you on your way, that won’t overwhelm, you really only need three things! It can be so easy to become overwhelmed when going against the “grain” of everything we’ve been taught our entire lives, however, deep down, nobody really wants to take the easy way out. Regaining and maintaining control of your health is far easier than most think, with resources designed to be user-friendly, simple, and useable on a consistent basis. 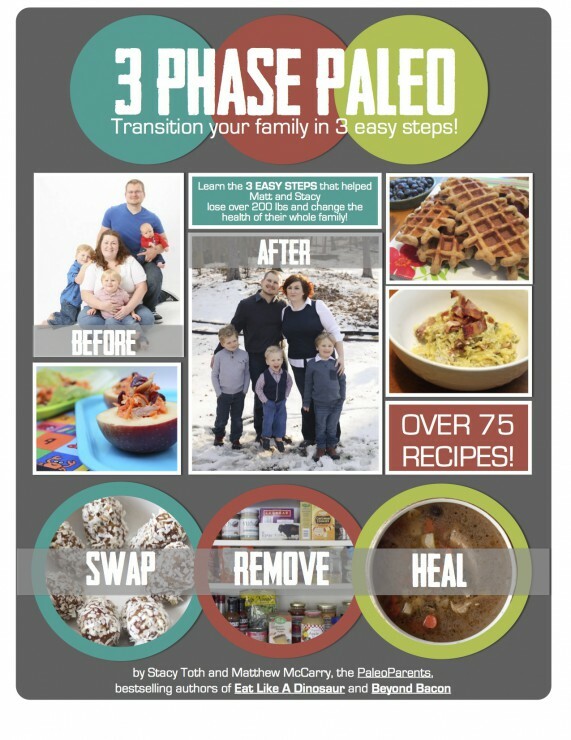 Enter, 3 Phase Paleo, Transition your family in 3 easy steps by Stacy and Matt, The Paleo Parents. I am honored to have the opportunity to review The Paleo Parents first published eBook! Do you know their story? It’s inspirational on so many levels. If you’re not familiar with The Paleo Parents, you should be. Their effort to take control of their health by making lifestyle changes and then taking it further to create a real food and healthy lifestyle for their three young boys, is just plain awesome. They’re the bestselling authors of Eat Like A Dinosaur and Beyond Bacon, they manage their beautiful blog at www.paleoparents.com, and co-host and produce a top reviewed podcast, The Paleo View. They’re practical, and they don’t judge – which is hands down, my favorite thing about their approach to this lifestyle! When I transitioned to a paleo lifestyle, I was introduced by a friend and was about 60% on my way; I just hadn’t realized I was somewhat “paleo” yet. I started researching, removing harmful foods/ingredients, but it has been a LONG process. And I stress, long. I googled constantly and initially felt like all I should eat, was salad without dressing. If only, I’d had a guide that didn’t make me feel like I was a complete failure if I indulged in chocolate here or there, or had a little rice. That’s exactly what 3 Phase Paleo is. A non-judgmental, informative, supportive guide filled with help. Their phase 1 is my favorite, in part because it suggests removing chemicals/ingredients that are harmful to our health, but if struggling or trying to attempt a transition, still indulge in things like gluten-free pasta or grains. Much of the perception of paleo is “if you eat that you’re going to hell” but that isn’t the case. If you want some pasta, at least eat gluten-free! It’s a step, or phase, in the right direction. This is what Phase 1 is all about. Remove the refined, processed ingredients, and swap them for real replacements. You’re not perfect, and this eBook doesn’t expect you to be! This phase is so vital, but easier than most might think. After having swapped and removed refined and chemical based products, it’s time to move forward with removing additional food that most may think are beneficial and nutrient filled, but are not and may be causing more damage to our bodies and health than we’d ever think. Phase 2 is somewhat experimental to try to determine if your body can actually tolerate these foods. Mine, can’t tolerate beans, peanuts, soy, and dairy in normal American standard portions. The explanation at the beginning of Phase 2, of what exactly grains, dairy, legumes and processed oils are, as well as the impact they have on health, is extremely beneficial. Phase 3 is where I’m currently at. I suffered for so many years, and went through oodles of diagnostic testing and drugs with no result. Not until I completed Phase 1 and Phase 2, did Phase 3 come naturally, learning more as I go. I had no idea what “super-foods” were until I went paleo. It isn’t acai. As stated in Phase 3 of 3 Phase Paleo, its bone broth and gelatin, seafood, organ meats, fermented foods, etc. This section addresses the autoimmune aspect that most of us deal with today, and just don’t realize through modern medicine. There are foods that can help heal. Included in each phase of the 3 Phase Paleo eBook are helpful guides, food swaps, a pantry guide, shopping lists, etc. already created for you, to help you transition your lifestyle. The Paleo Parents provide multiple brand names, and recommendations of where to buy more nutrient dense ingredients for you and your family. Everyone included. Last, the eBook is filled with their amazing recipes (Blueberry Breakfast Cookies, I mean seriously? And Crab Balls, aaaahhh!)! They’re easy and will help everyone continue on their 3 Phase Paleo transition, making it a lifestyle and helping families understand that eating healthy is easy, in 3 phases! To learn more about 3 Phase Paleo and purchase your eBook, click here! I’m excited to team up with the Paleo Parents to offer a giveaway of one copy of the 3 Phase Paleo eBook! You can enter the giveaway on the LivingLikeLinds Facebook page under the Rafflecopter! This entry was posted in Book Reviews and tagged 3 Phase Paleo, Paleo, Paleo Parents by livinglikelinds. Bookmark the permalink.